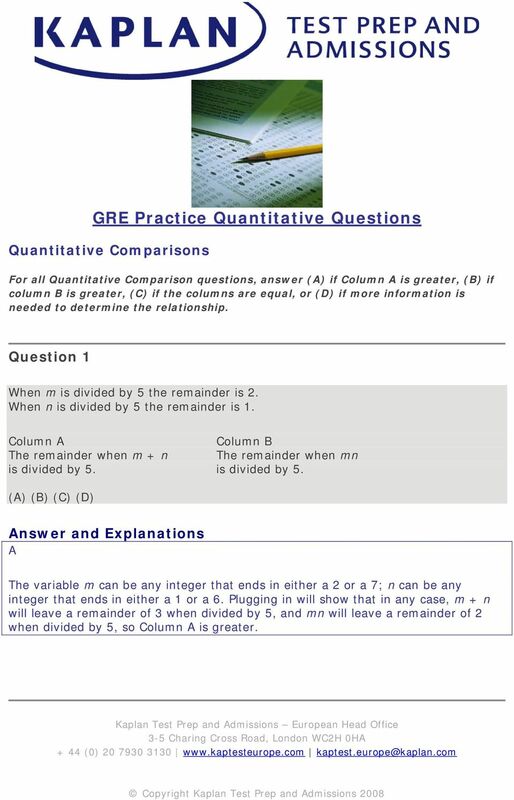 3 GRE Practice Quantitative Questions Quantitative Comparisons For all Quantitative Comparison questions, answer (A) if Column A is greater, (B) if column B is greater, (C) if the columns are equal, or (D) if more information is needed to determine the relationship. Question 1 When m is divided by 5 the remainder is 2. When n is divided by 5 the remainder is 1. Column A Column B The remainder when m + n The remainder when mn is divided by 5. is divided by 5. (A) (B) (C) (D) Answer and Explanations A The variable m can be any integer that ends in either a 2 or a 7; n can be any integer that ends in either a 1 or a 6. Plugging in will show that in any case, m + n will leave a remainder of 3 when divided by 5, and mn will leave a remainder of 2 when divided by 5, so Column A is greater. 4 Question 2 2a + b = 17 b - 3 = 2 Column A a Column B b (A) (B) (C) (D) Answer and Explanations A You can solve for b using the second equation: b - 3 = 2, so b = 5. 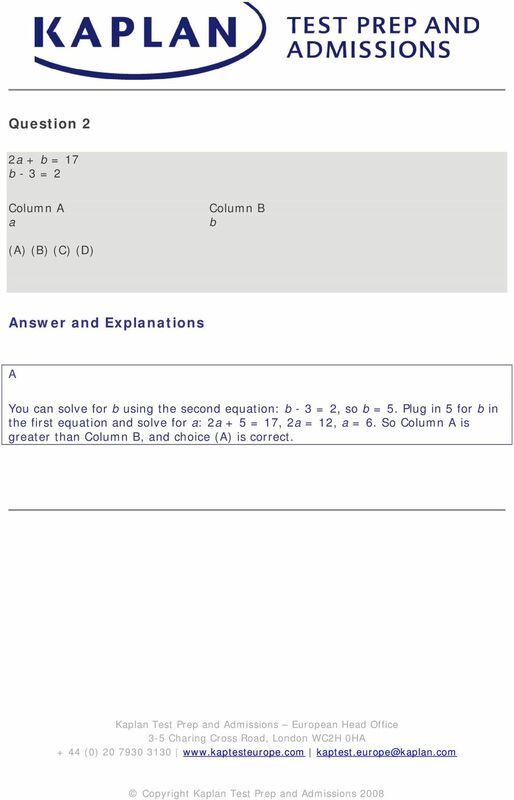 Plug in 5 for b in the first equation and solve for a: 2a + 5 = 17, 2a = 12, a = 6. So Column A is greater than Column B, and choice (A) is correct. 5 Question 3 x > 1 Column A x 5 Column B (x³)² (A) (B) (C) (D) Answer and Explanations B First figure out what the simplified form of Column B is. Since x³ is squared, you must multiply the exponents, leaving you with x 6. Since x is greater than 1, the number gets larger as it is raised to higher powers. 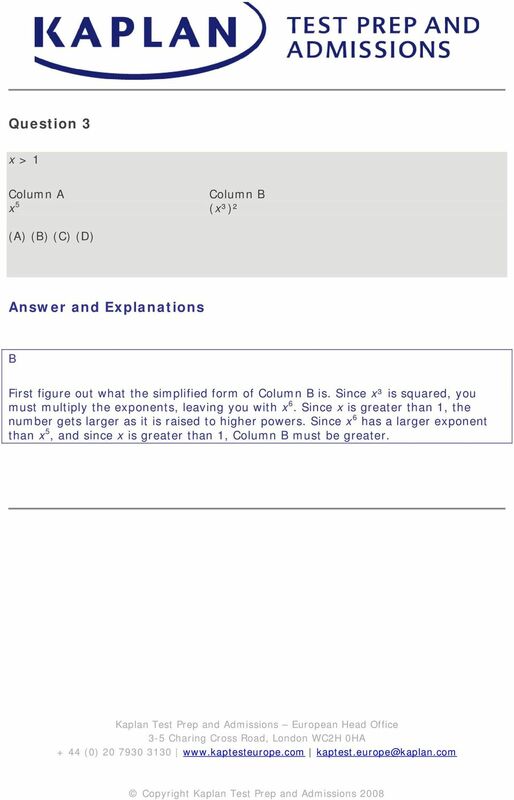 Since x 6 has a larger exponent than x 5, and since x is greater than 1, Column B must be greater. 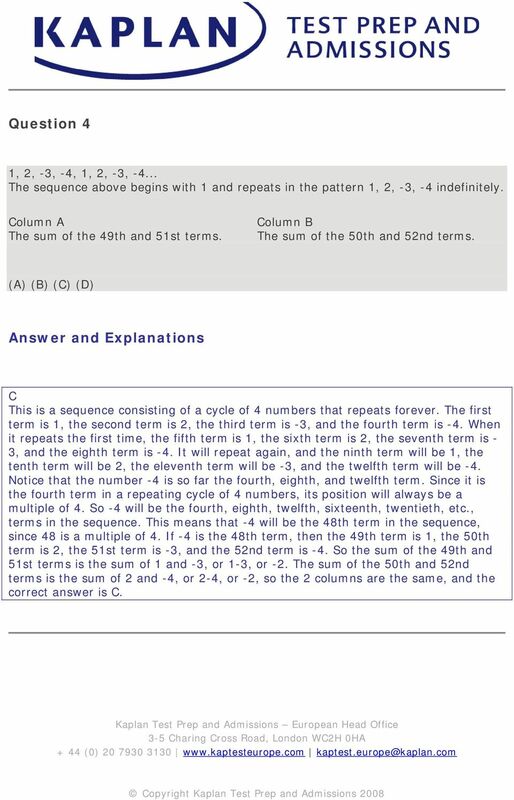 6 Question 4 1, 2, -3, -4, 1, 2, -3, The sequence above begins with 1 and repeats in the pattern 1, 2, -3, -4 indefinitely. Column A The sum of the 49th and 51st terms. Column B The sum of the 50th and 52nd terms. (A) (B) (C) (D) Answer and Explanations C This is a sequence consisting of a cycle of 4 numbers that repeats forever. The first term is 1, the second term is 2, the third term is -3, and the fourth term is -4. When it repeats the first time, the fifth term is 1, the sixth term is 2, the seventh term is - 3, and the eighth term is -4. It will repeat again, and the ninth term will be 1, the tenth term will be 2, the eleventh term will be -3, and the twelfth term will be -4. Notice that the number -4 is so far the fourth, eighth, and twelfth term. Since it is the fourth term in a repeating cycle of 4 numbers, its position will always be a multiple of 4. So -4 will be the fourth, eighth, twelfth, sixteenth, twentieth, etc., terms in the sequence. This means that -4 will be the 48th term in the sequence, since 48 is a multiple of 4. If -4 is the 48th term, then the 49th term is 1, the 50th term is 2, the 51st term is -3, and the 52nd term is -4. So the sum of the 49th and 51st terms is the sum of 1 and -3, or 1-3, or -2. The sum of the 50th and 52nd terms is the sum of 2 and -4, or 2-4, or -2, so the 2 columns are the same, and the correct answer is C.
9 E. 12 Answers and Explanations C We can use the strategy of Picking Numbers to solve this question. With the method of Picking Numbers, all 4 incorrect answer choices must be eliminated because sometimes one or more incorrect answer choices will work for the particular values that we select. Let's let a = 6 and b = 3. Then a 2 b 2 = = 36 9 = 27. Looking at the answer choices, 27 is not a multiple of 6, 8, 10, or 12, which are the numbers in answer choices (A), (B), (D), and (E), respectively. So choices (A), (B), (D), and (E) can be eliminated. Now that all 4 incorrect answer choices have been eliminated, we know that choice (C) must be correct. Just to check, we see that 27 is a multiple of 9, which is to be expected since we have concluded that choice (C) must be correct. 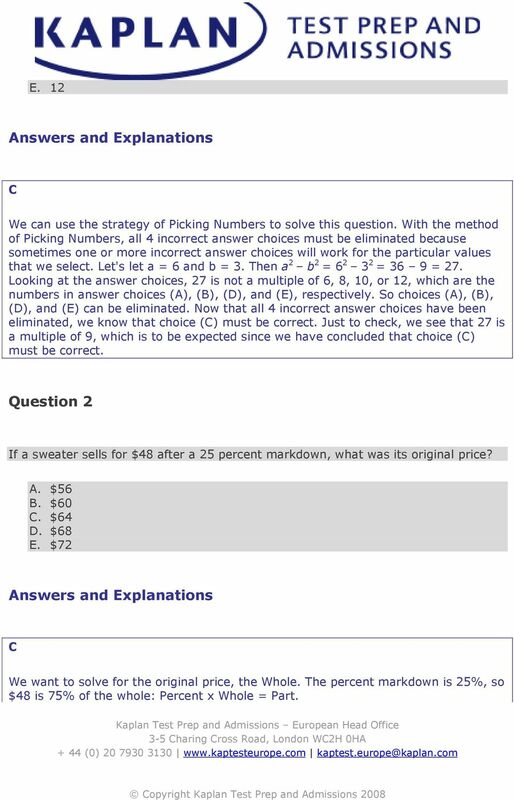 Question 2 If a sweater sells for $48 after a 25 percent markdown, what was its original price? A. $56 B. $60 C. $64 D. $68 E. $72 Answers and Explanations C We want to solve for the original price, the Whole. The percent markdown is 25%, so $48 is 75% of the whole: Percent x Whole = Part. 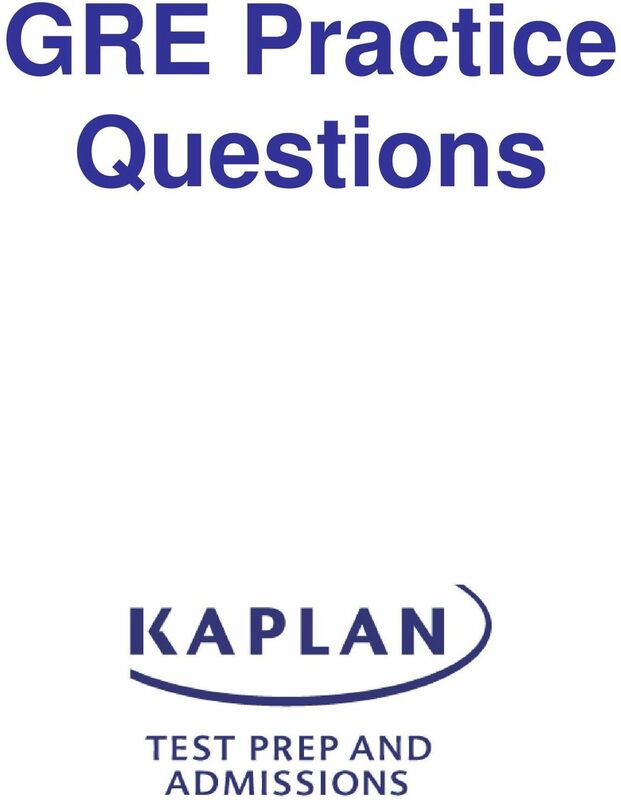 11 Answers and Explanations E Start in the parenthesis and work out: (3 5)= 3(3-5)= 3(-2)= -6; 4 (-6)=4[4-(- 6)]= 4(10)= 40 Question 5 If there are 14 women and 10 men employed in a certain office, what is the probability that one employee picked at random will be a woman? F. 1/6 G. 1/14 H. 7/12 I. 1 J. 7/5 Answers and Explanations B Probability = (Number of Desired Outcomes/Number of Possible Outcomes) = (Number of Women/Number of People) = 14/24= 7/12. 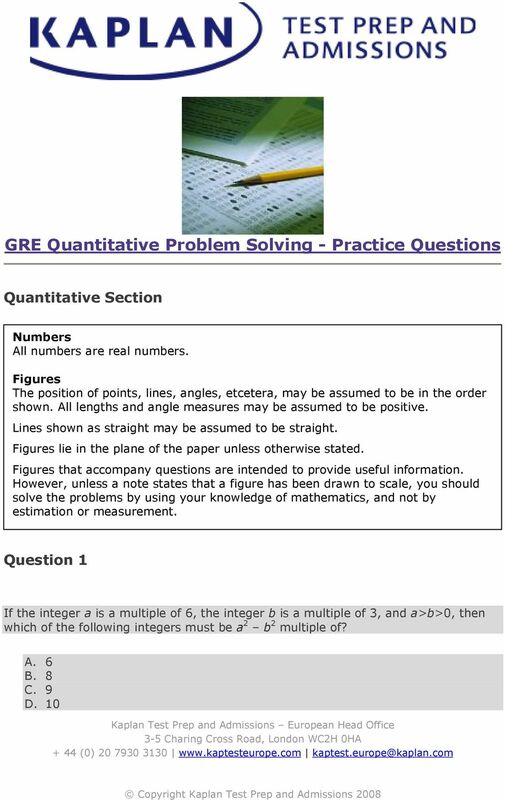 13 GRE Reading Comprehension Practice Questions Each passage in this section is followed by several questions. 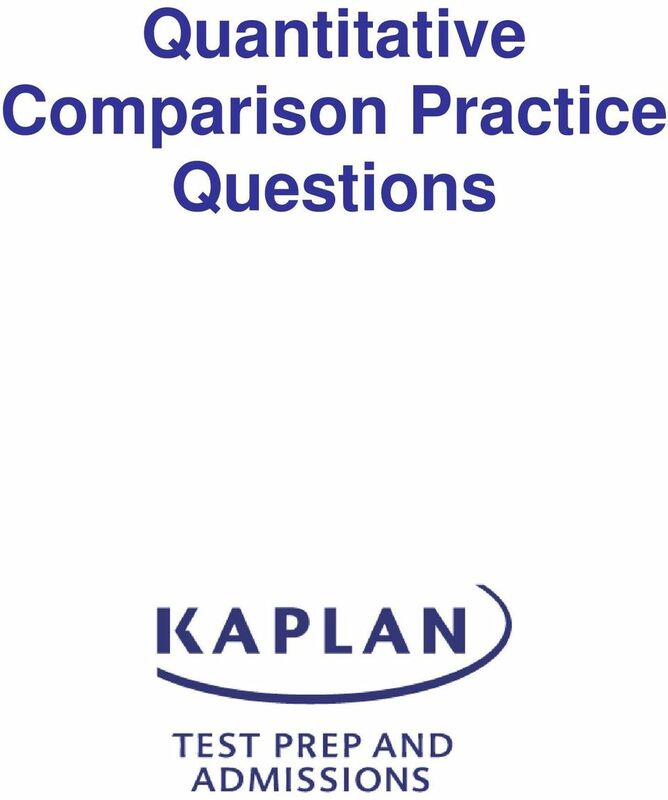 After reading the passage, choose the best answer to each question based on the content of the passage. 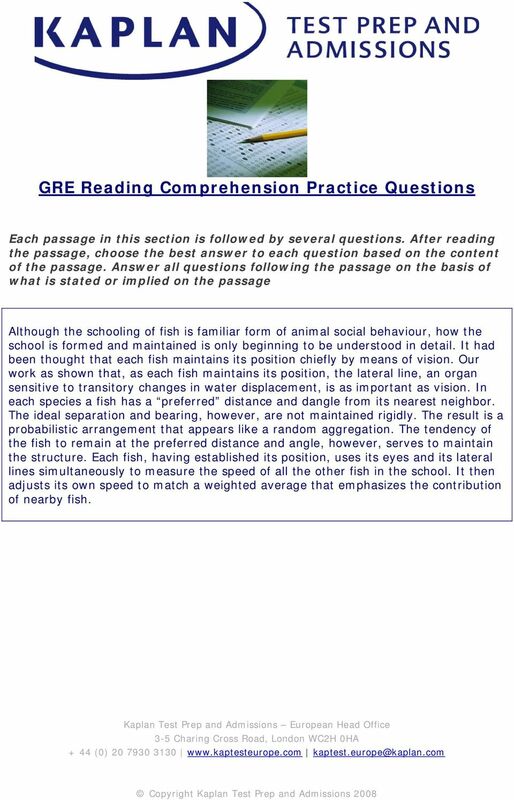 Answer all questions following the passage on the basis of what is stated or implied on the passage Although the schooling of fish is familiar form of animal social behaviour, how the school is formed and maintained is only beginning to be understood in detail. It had been thought that each fish maintains its position chiefly by means of vision. Our work as shown that, as each fish maintains its position, the lateral line, an organ sensitive to transitory changes in water displacement, is as important as vision. In each species a fish has a preferred distance and dangle from its nearest neighbor. The ideal separation and bearing, however, are not maintained rigidly. The result is a probabilistic arrangement that appears like a random aggregation. The tendency of the fish to remain at the preferred distance and angle, however, serves to maintain the structure. Each fish, having established its position, uses its eyes and its lateral lines simultaneously to measure the speed of all the other fish in the school. It then adjusts its own speed to match a weighted average that emphasizes the contribution of nearby fish. 15 Answers and Explanations Schools of Fish Passage The style of this natural science passage is factual, descriptive, and straightforward, although the discussion does get fairly detailed. The topic is clear from the first sentence: our knowledge of how fish schools are formed and how their structure is maintained. 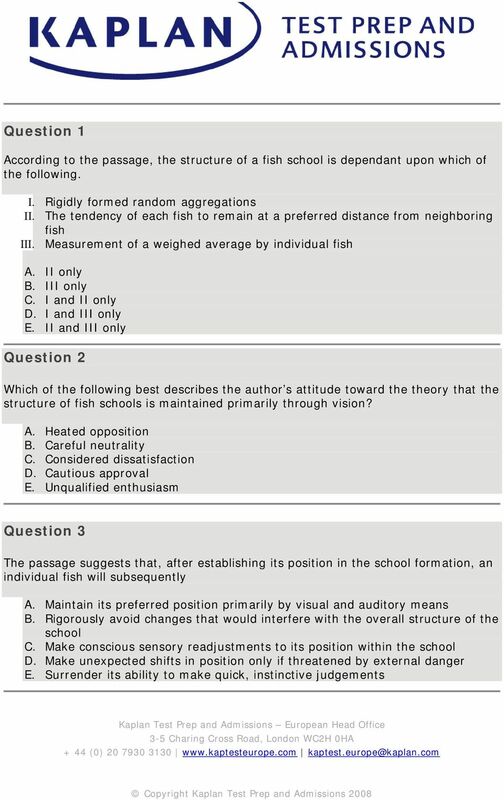 The next two sentences get more specific and express the author s main point, which is that, contrary to the previous theory, the structure of fish schools is not merely dependant on vision but also involves the lateral line, an organ sensitive to transitory changes in water displacement. The tone is objective and positive, but it s worth noting that since the author is contrasting the new knowledge about lateral lines with older, outdated knowledge, he must be sceptical of the notion that the vision is the only means of forming and maintaining fish schools. The rest of the passage is a more technical report of how the schools are structured, how individual fish actually behave in forming schools-this is all merely detail and the best way to deal with it is to read attentively, but more quickly than earlier lines. The Questions Question 1 E This Roman numeral-format question focuses on detail. The stem is asking what the structure of fish schools depends on, and the focus is on the more technical elements in the last half of the passage. The author states the ideal positions of individual fish aren t maintained rigidly, and this contradicts statement I right away. The idea of random aggregation appears: the school formation results from a probabilistic arrangement that appears like a random aggregation, so the idea is that fish are positioned probabilistically, but not rigidly so. 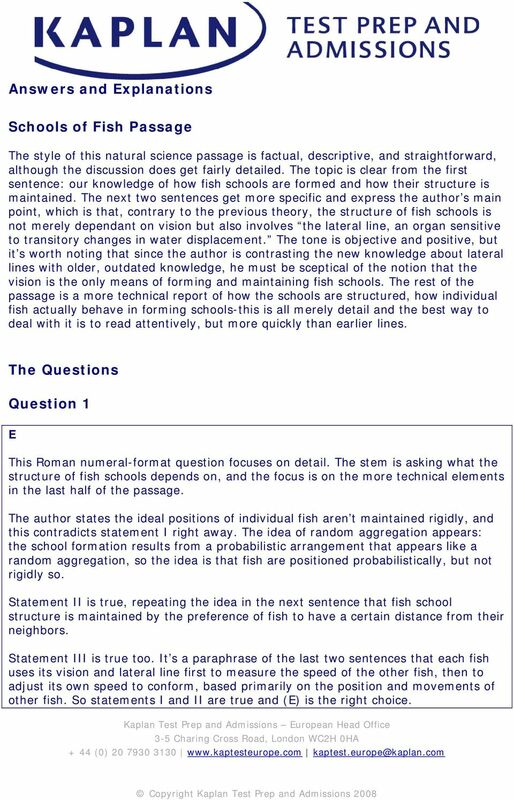 Statement II is true, repeating the idea in the next sentence that fish school structure is maintained by the preference of fish to have a certain distance from their neighbors. Statement III is true too. It s a paraphrase of the last two sentences that each fish uses its vision and lateral line first to measure the speed of the other fish, then to adjust its own speed to conform, based primarily on the position and movements of other fish. So statements I and II are true and (E) is the right choice. 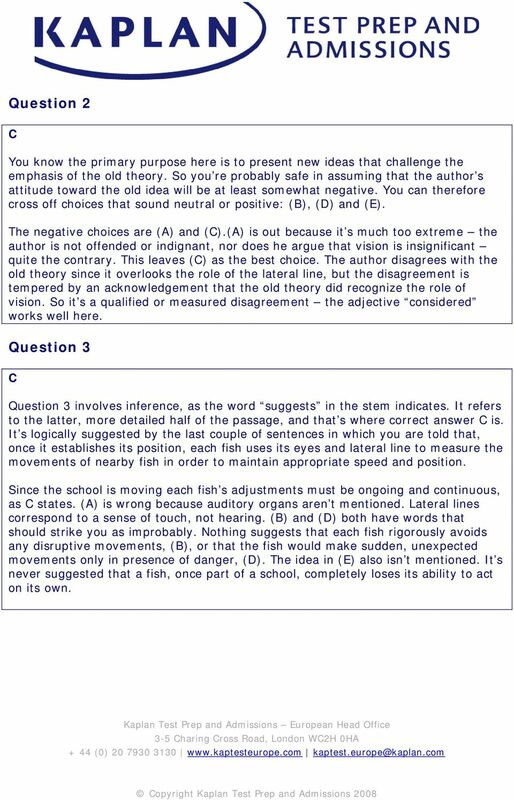 16 Question 2 C You know the primary purpose here is to present new ideas that challenge the emphasis of the old theory. So you re probably safe in assuming that the author s attitude toward the old idea will be at least somewhat negative. You can therefore cross off choices that sound neutral or positive: (B), (D) and (E). The negative choices are (A) and (C). (A) is out because it s much too extreme the author is not offended or indignant, nor does he argue that vision is insignificant quite the contrary. This leaves (C) as the best choice. The author disagrees with the old theory since it overlooks the role of the lateral line, but the disagreement is tempered by an acknowledgement that the old theory did recognize the role of vision. So it s a qualified or measured disagreement the adjective considered works well here. Question 3 C Question 3 involves inference, as the word suggests in the stem indicates. It refers to the latter, more detailed half of the passage, and that s where correct answer C is. It s logically suggested by the last couple of sentences in which you are told that, once it establishes its position, each fish uses its eyes and lateral line to measure the movements of nearby fish in order to maintain appropriate speed and position. Since the school is moving each fish s adjustments must be ongoing and continuous, as C states. (A) is wrong because auditory organs aren t mentioned. Lateral lines correspond to a sense of touch, not hearing. (B) and (D) both have words that should strike you as improbably. Nothing suggests that each fish rigorously avoids any disruptive movements, (B), or that the fish would make sudden, unexpected movements only in presence of danger, (D). The idea in (E) also isn t mentioned. It s never suggested that a fish, once part of a school, completely loses its ability to act on its own. USING PLAYING CARDS IN THE CLASSROOM. What s the Pattern Goal: To create and describe a pattern. Closest to 24! 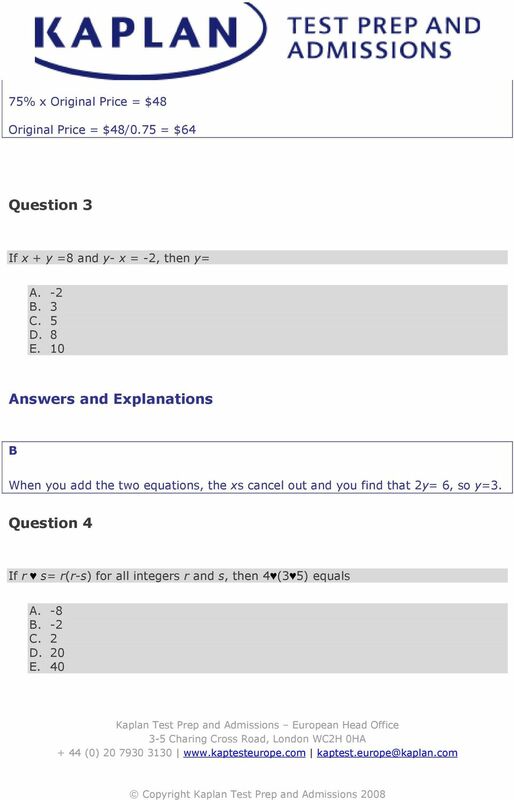 Teaching & Learning Plans Arithmetic Sequences Leaving Certificate Syllabus The Teaching & Learning Plans are structured as follows: Aims outline what the lesson, or series of lessons, hopes to achieve. 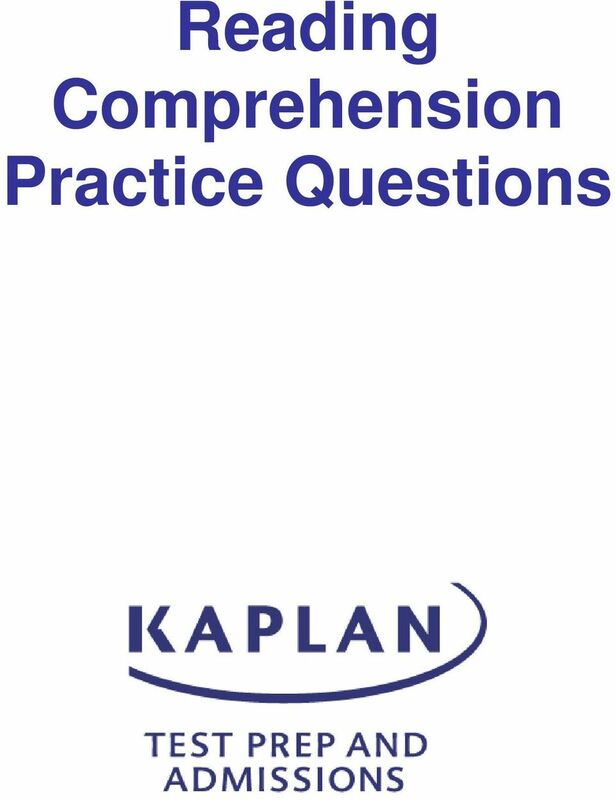 READTHEORY Passage and Questions Reading Comprehension Assessment Directions: Read the passage. Then answer the questions below. Name Date Beautiful, but Endangered Giant Panda Bears are beautiful creatures. Name Period Date 8-1 STUDENT PACKET MATHLINKS GRADE 8 STUDENT PACKET 1 INTEGERS REVIEW 1.1 Integer Operations: Patterns Explore the meaning of integer addition, subtraction, multiplication, and division. Number Talks. 1. Write an expression horizontally on the board (e.g., 16 x 25). Two examples of how the concept of the mode is used in reporting statistical results are as follows. Maths Vocabulary Support Booklet The aim of this booklet is to help parents to understand and use the technical maths vocabulary accurately and confidently so you can help your children to do the same. MEP Pupil Text 12. A list of numbers which form a pattern is called a sequence. In this section, straightforward sequences are continued. Implied Main Ideas Anything you read has two basic parts: a main idea and the supporting details that explain and develop that idea. The main idea is usually clearly stated in one sentence of a selection. ACT TEST TAKING STRATEGIES ENGLISH TEST READING PASSAGES 1. 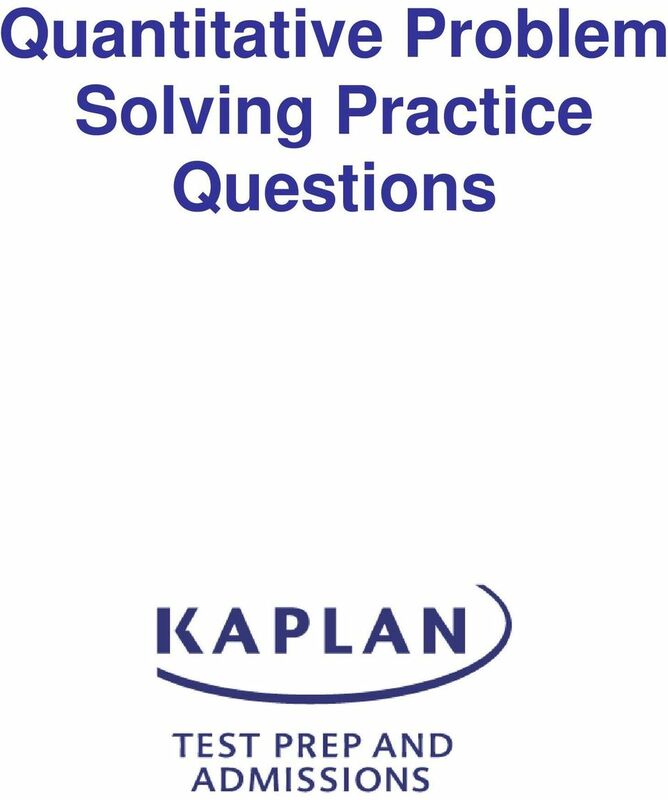 Skim each paragraph, answer the questions that pertain to it, then read on. 2. The long answer is not always better. When in doubt, take it out. 3. Logical Reasoning in Mathematics Many state standards emphasize the importance of reasoning. We agree disciplined mathematical reasoning is crucial to understanding and to properly using mathematics. In order to master the techniques explained here it is vital that you undertake plenty of practice exercises so that they become second nature. Since the ratios are constant, the sequence is geometric. The common ratio is. Answer: The relationship cannot be determined.